With the World Cup fully underway there is no doubt that it is amongst the largest platforms for brands to present themselves. The final of 2014 alone had 3.2 billion viewers tune in, which was just under half the population of the entire planet. To big business that means dollar signs and they will stop at nothing to make sure their brand is in front of those numerous viewers. This means that the sponsorship and partner slots are seen as extremely lucrative, but how many people know the brands they are being bombarded with? This chart of the day tells us the awareness of the main sponsors and partners. 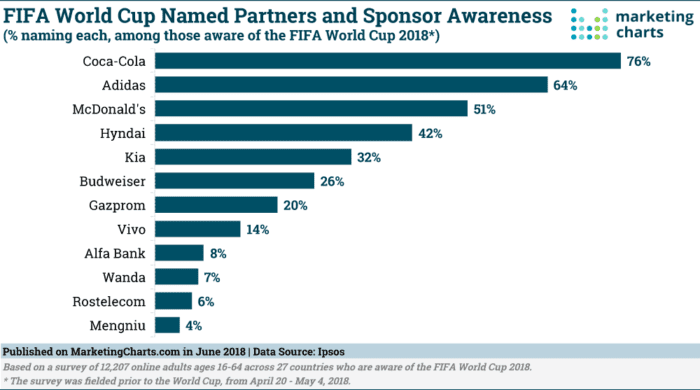 This research from Marketing Charts and Ipsos gives a great insight into how well these brands are known by the football lovers. The online survey of 12,207 people aged 16-24 was done across 27 countries and completed before the start of the tournament itself. The chart shows that the big hitter, Coca-Cola, lead the way in awareness, with 76% of respondents recognizing them as a brand. At the other end of the scale, you have Mengniu, the Chinese dairy company, of which only 4% of respondents were aware of them as a brand. The value to these brands positioning themselves as sponsors probably works in reverse to their awareness. If 76% of people already know Coca-Cola then is there much value in spending the millions of dollars on the placement? You could argue that Mengniu investment would have the highest value percentage in terms of ROI. It all comes down to how much was spent vs revenue created, but sometimes the value is accomplished further down the line than in immediate sales. You can see some of the investment figures here.